In case you missed any of the posts on Facebook, we are back, Edmonton! 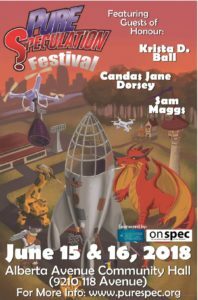 We’re busy gearing up for June as we speak, and this year is going to be a huge celebration of Edmonton’s science fiction and fantasy nerdery! We have new events coupled with the return of some old favourites (Internerd BBQ, anyone? ), all packed together in the Alberta Avenue Community Hall. And attendance is still free. Volunteer: Our volunteers are the backbone of the festival, and we couldn’t do what we do without them. If you’d like to help out, even for just a few hours, consider filling out the volunteer form and joining our team! Panelist or Presenter: Have a nerdy topic you want to talk about? Are you an author looking to show off your work to an appreciative crowd? Have a geeky talent you’d like to demonstrate or teach? We want you! Fill out the event proposal form and let us know something about yourself and your event idea, and become part of the celebration! And of course the last, and arguably the best, way to be part of the festival is to attend! Grab some friends and come on down, have lunch, take in a panel or two, play a game, see some demos, get your face painted, pick up some nerdy swag and books…there is so much to do, packed into a day-and-a-half. In the meantime, keep checking the website for updates. And look for our posters, popping up all over Edmonton. Next Next post: Internerd Returns!